Louis Vuitton Makes Its Brooklyn Debut, Street-Vendor Style! The Takashi Murakami–Louis Vuitton exhibit kicks off tonight at the Brooklyn Museum with a swanky party and the requisite performance by Kanye West. 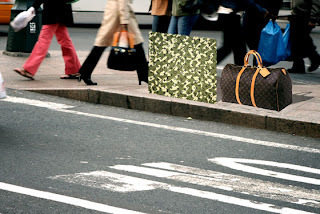 In a courageous statement against counterfeit handbags, real Louis Vuitton handbags and the new Monogramoflauge canvases will be sold on ten tables outside the museum. You know, street-vendor style. "We think that by highlighting it in a happening way and not in a boring way, it will make everybody more aware," Yves Carcelle, chairman and chief executive officer of Louis Vuitton told WWD. So … the idea is that if an unaware tourist tries to buy a bag thinking she can afford it, the cashiers can cry "Ha-ha! Gotcha!" and then give her a pamphlet about the counterfeit industry? There are going to be a lot of embarrassed people in Brooklyn tonight.